Well, what can we say? An absolutely amazing year in so many ways. As well as giving away lots of holidays to inspirational families, we’ve got our very own shop, we’ve started a huge fundraising campaign for a THHN bungalow so that we can help those in the most difficult of circumstances, we’ve launched a brand new event for 2015, we’ve welcomed a very exciting celebrity Ambassador (make sure you read our special Did you Know? section) and we’ve witnessed some truly amazing generosity from lots and lots of people. All the time, we see what THHN holidays mean to the families who take them and we are committed to providing as many holidays as possible to wonderful families who are going through a terrible time. This is, and always will be, our aim. So thank you, from the bottom of our hearts, to everyone who has played a part in 2014. We are only as strong as the team we have around us. And, as we begin another year, we do so with enthusiasm and determination to continue the work of THHN and we very much hope that you will continue to be at our side. What a great time we had at the 8.5 mile Cockington Christmas Caper Trail Race. Thank you so much to Matthew and Rob Day of the Barnabus Sports Trust and their team for choosing THHN to be the 2014 charity. We have now received a cheque for £473 from the event – amazing. Thanks too to all our runners who took part and everyone who helped out. What a lovely time we had at the magical Pennywell Farm Nativity event which they, yet again, held in aid of us. It was a lovely evening and £462.55 was raised for us. The team at Pennywell are such fantastic supporters of THHN and we’d like to thank them all so much, particularly owner, Chris Murray, and Manager, Valerie Worthington. We celebrated the grand opening of our first ever shop on Tuesday 16 December and what an amazing day it was. We couldn’t be more delighted with the shop and a huge thank you goes out to everyone who helped with this project, particularly our superb Shop Manager, Carolanne Hart, her partner Neil, and his parents. As well as them we’d also like to thank Angela and John Bunce, Brian Lewis, Bob Vaughan, Medworth Plumbing and Heating Ltd, Ben Norton and the team at Swift Carpets and Flooring, St Marychurch Sainsbury’s and 3663, all of whom helped make the shop, and our grand opening, such a success. 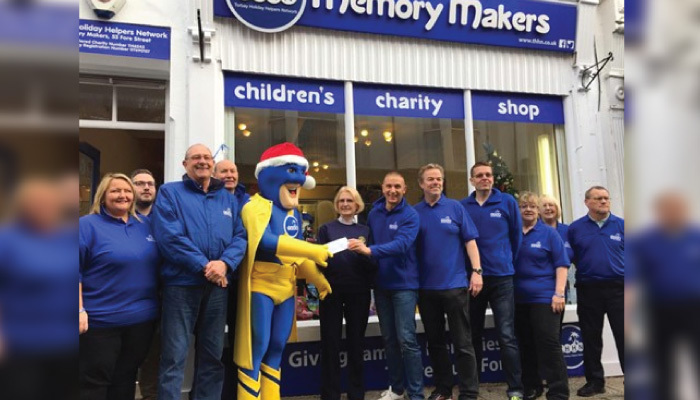 As well as all the excitement of the new shop opening we also received a donation of £750 from Babbacombe Model Village from their Wishing Well Fund and Maureen MacDonald from the Rotary Club of Torquay presented a cheque for £150 to buy a very special Christmas present for a very special young lady. As if all of that wasn’t enough, some of the team from Palm 105.5FM delivered an amazing selection of 50 Christmas presents for THHN children to enjoy this festive season. The gifts were donated as part of their “Give a Gift” campaign. In December we sent a family referred from the WellChild charity to Euro Disney, for a precious memory making holiday. This is the first of two special breaks sponsored by our good friends at Peak Performance Gym in Torquay, who organised their fantastic Superstars event to fund the two holidays. A huge and heartfelt THHN thank you goes out to Peak Performance owner Miles Leeson, all of his incredible team and all of the amazing competitors and business sponsors who made these holidays possible! We’ve had some delightful entries for our Christmas card design competition and there’s still time to enter as we’ve extended the deadline to 15 January. Don’t forget that everyone who enters will be in with a chance to win a trip to Babbacombe Model Village for their entire class and the child who creates the winning design from their year group will also get to take their class for a fantastic visit to see the little folk of Babbacombe and receive a visit from THHN Memory Maker Man. From the six finalists, three winners will be chosen and their design will go into production for use as next year’s THHN Christmas cards. The three winners will also win some ToysRUs vouchers, courtesy of our terrific friends at Teddy Mountain. If your child would like to take part please just e-mail roger@thhn.co.uk who will get all the info over to you. This Christmas the Hotel De La Mer was honoured to have a family referred by Rainbows Hospice for Children and Young People staying for a very special Christmas break. Local groups and businesses ensured that it was indeed a holiday of special memories for this family. Mother and Father Christmas stopped by to present the family with a Christmas hamper donated by the St Marychurch branch of the TSB. A very special young lady who is having a particularly tough time was given a Nintendo 3DS which was purchased with funds donated by the Rotary Club of Torquay and lots of games funded by donations from Peak Performance Exeter and the Peak Performance Gym, Torquay. Thank you to everyone involved. We are looking for runners of all abilites to join our great group of runners in 2015. Get your tickets now for this amazing night of entertainment on Saturday 28 February at the Rainbow Hotel in Torquay. Your host for the evening will be the terrific Tank Sherman. With close-up magic from Peter Baffles to start the evening the acts include Keedie, Sean Perry, Carolynn May, Mike Samuels, Gasoline Alley, Abba Tribute, Yours in Harmony, Supreme Dream, Becky Bennett, Stewart Masters. As if all of that wasn’t enough, there will be a disco until the early hours as well as an auction and raffle with some fantastic prizes on offer. To get your hands on tickets for this great night Bob Vaughan is the man you need so either e-mail him at bob.Vaughan@btinternet.com or give him a call on 07941 571318. Please email brian@thhn.co.uk for details of our Team THHN Gold Bond charity places. Dougie Worthington for all his amazing photography for us. Pictures speak volumes and Dougie comes up trumps time and time again giving us his time and talent to ensure we have some wonderful images to share. Dartmoor Christmas Trees who made us their chosen charity this year. Emily Knapman for masterminding the brilliant THHN Christmas Party.